JAMES HENRY MARTINEAU, was a MORMON SHOOTER AND CLUBBER a regimental adjutant to Col William. H. Dame. 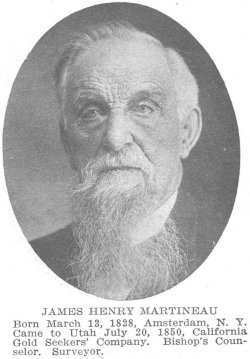 of Eldridge, N Y ); born March 13, 1828, Amsterdam, N. Y. Came to Utah July 20, 1850, California Gold Seekers' Company. Married Susan Ellen Johnson Jan. 8, 1852, Fort Johnson, Utah (daughter of Joel Hills Johnson and Anna Pixley of Kirtland, Ohio, and Nauvoo, Ill, pioneers Sept 1, 1848) She was born July 11, 1836, in Kirtland Their children Henry Augustus, m Editha Melissa Johnson, Moroni Helaman, m Sarah Sophia Johnson, Susan Elvira, m Benjamin Samuel Johnson, John William, d aged 3 years, Nephi, m Emeline Pamelia Knowles, George Albert, m Emma Pauline Allred; Joel Hills, m Mary Ann Thurston, Gertrude, m Everett Guy Taylor, Theodore, m. Josephine Thurston, Anna Sarah, m Henry Samuel Walzer, James Edward, d. aged 3 years, Dora, d aged 19 years. Married Susan Julia Sherman Jan 18, 1857, Salt Lake City (daughter of Lyman Royal Sherman and Delcena Diadamia Johnson of Kirtland, Ohio and Missouri, pioneers 1853, Almon W Babbit company). She was born Oct 21, 1838, Far West, Mo Their children- Delcena Diadamia b Nov 27, 1857, died, Lyman Royal b April 21, 1859, m Alley Preston, Charles Freeman b July 24, 1861, m Eva Rosetta Rice, Jesse Nathaniel b April 6, 1863, m. Eliza Bell Johnson, Julia Henrietta b Feb 4, 1865, d Jan 9, 1885, Elizabeth b Aug 13, 1867, m Frank Knowlton Nebeker, Virginia b July 16, 1870, m Edward E Sudbury, Joseph b April 23, 1873, d. May 10, 1873. Family resided Logan and Salt Lake City. Married Jessie Helen Anderson Russell Grieve April 18, 1887, Salt Lake City (daughter of Simon Grieve and Miss Anderson of Salt Lake City), who was born Nov. 23, -1867, died 1902 in Salt Lake City. High priest, bishop's counselor. Regimental adjutant of Iron and Cache military districts, Nauvoo Legion, Indian war veteran. County surveyor, county clerk, sheriff, U S deputy internal revenue collector, U. S. deputy land and mineral surveyor. Located what is now called Oregon Short Line from Ogden City to Idaho, was topographical and construction engineer in construction of the Union Pacific Railroad, also located railway in Mexico.